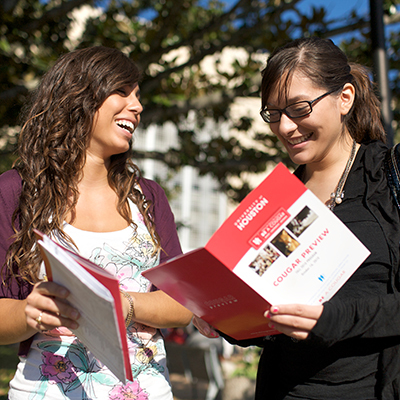 Information for newly admitted students. The UH in 4 program is a partnership between the University and students to support graduation within four years. The program provides a comprehensive plan to help students navigate their four-year college experience. Cub Camp is an extended orientation program where first-year students go just before classes begin to come together as a class, have fun, make friends, and learn more about creating a successful life at UH and in Houston. Join us for this opportunity that helps you build your new UH community before you ever arrive on campus. For three days and two nights, you along with other incoming students and upperclassmen leaders will head to an off-campus retreat center and learn more about UH, its traditions, and your new UH family. Filled with fun activities, student success tips and new friendships, Cub Camp is one event that you definitely do not want to miss! The Provost Summer Read Program is built around a common book that is read over the summer by all first year students. After first year students arrive on campus to begin their fall semester of classes, they will participate in a meaningful dialogue with faculty and your peers, inside and out of the classroom.